This walk: 2011-12-14. 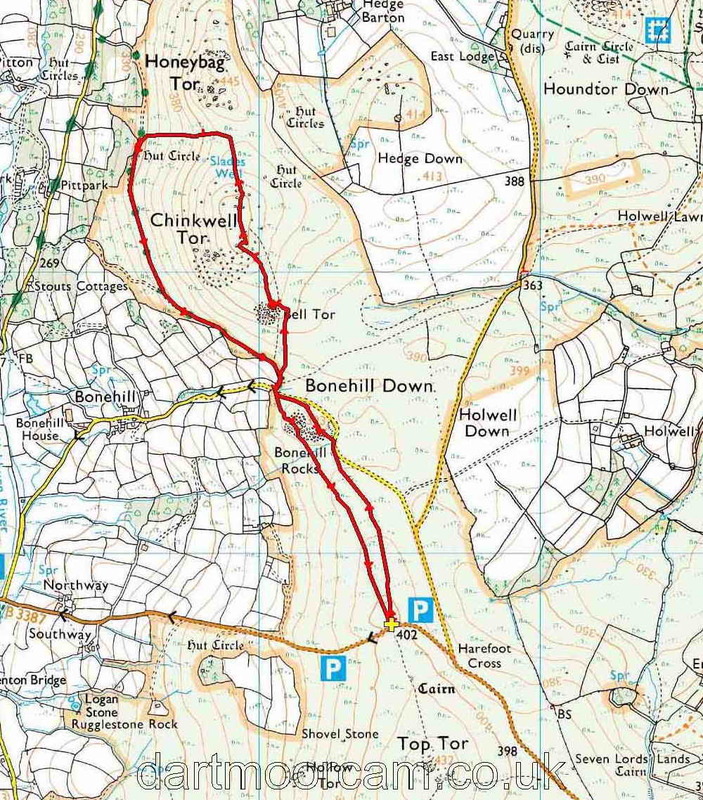 Bonehill Rocks, Bel Tor, Haytor Rocks, St Pancras Church, Cathedral of the Moor, Widecombe-in-the-Moor, rock pans, Chinkwell Tor, Honeybag Tor, cairns, Thornhill Lane, Sharp Tor. Another walk in this area was undertaken on 5 November 2009. A good place to shelter from the strong wind and the horizontal rain that was only broken by the snow that followed - also horizontal! See that white stuff between us and Haytor Rocks? A precarious rock pile on the way to Bel Tor. St. Pancras Church at Widecombe-in-the-Moor, known as "The Cathedral of the Moor" - the sun is shining! Approaching Bel Tor - look at the length of the shadows! Looking towards Haytor Rocks (left) and Saddle Tor (right). The pond might be that at SX 7444 7713, although this might be erroneous. Zoomed view to Chinkwell Tor. Rock pan on a second pile. A little snow on the slope of Hamel Down. Another view down to Widecombe. Closer view, with a little snow. Jess, in mid-air, not to be outdone! Looking up at HoneybagTor - we turned left just ahead. Looking back at Honeybag Tor. Another precariously perched rock, seen from Thornhill Lane; this was a well-used horse and wagon route between the Natsworthy Manor area and Ashburton, heading via Hemsworthy Gate and Cold East Cross, stopping awhile at the New House Inn. Sharp Tor, a lesser tor on the west side of Chinkwell Tor, mentioned in Crossing's Guide to Dartmoor (page 296, 6th line from bottom, and page 314, 4th line from bottom). This walk was reached from Plymouth, via the A38 past Ashburton, turning off north at the Newton Abbot turn-off (signed "Widecombe"), via Hooks Cross, Owlacombe Cross, Halshanger Cross, Cold East Cross (turn right), Hemsworthy Gate and parking at the yellow cross (and the P symbol) on the map.